Researchers and artists collaborate to create a synthetic lava ocean entry. When a rapid response team of scientists from the University of Hawaiʻi at Mānoa’s Center for Microbial Oceanography: Research and Education (C-MORE) returned from an expedition to investigate the effects of the 2018 Kīlauea volcanic eruption on marine life, they brought back new understanding and a few mysteries. Addressing one of their new questions required a unique collaboration—between scientists and artists. As the world watched Kīlauea’s impressive display, oceanography professor and C-MORE director David Karl and colleagues were also keenly tracking satellite data showing the development of an algal bloom near the location where lava was entering the ocean off Hawaiʻi Island. A team was dispatched on the research cruise to examine the composition of the algal bloom and the nutrient cycling that supported its production. The researchers confirmed elevated concentrations of silica, iron and phosphorus in seawater surrounding the area, as was expected because the lava from Kīlauea is rich in those elements, among others. As often occurs in science, the fieldwork generated further questions, in particular about the production and losses of nutrients associated with lava-seawater interactions. An enigmatic finding showed that near the ocean entry nitrate, a limiting nutrient for most Hawaiian waters, also increased despite there being negligible nitrogen in lava. Lava pouring into seawater during experiment. Credit: Karin Bjorkman. To assess whether nitrate could come from lava interacting with air and seawater, the research team collaborated with artists from the UH Mānoa Department of Art and Art History to create a synthetic lava ocean entry. The scientists provided the art team with basaltic rock that was representative of the recent eruption. The artists, led by art instructor Linda Yamamoto, melted the rock to approximately 1200 degrees Celsius in a furnace typically used for bronze casting, then expertly poured the molten material into stainless steel beakers containing seawater. HILO — More than 30 residents of a lava-locked kipuka in lower Puna drove across the lava channel from last year’s Kilauea eruption Monday to return to their homes. Using a road graded over the lava channel by Puna Geothermal Venture, authorized residents can drive to and from a subdivision south of Highway 132 that was cut off by lava during the eruption. The road is an offshoot of one that was cut across the lava channel in December in order to restore access to PGV. While only PGV employees and suppliers have been able to use the road, now residents who signed an extensive waiver are permitted access to the roadway, although only at times designated by PGV. Mike Kaleikini, senior director of Hawaii affairs for PGV, said the road will be open for ingress from 8-11 a.m. and 4-7 p.m. Leaving the kipuka via the road will be permissible at any time, and Kaleikini said the hours of access might be changed in the coming weeks based on how traffic plays out this week. Access to the road is controlled by a checkpoint located just west of the intersection between Highway 132 and Pohoiki Road, that will remain staffed 24/7, Kaleikini said. Blank waivers can be obtained at the checkpoint. Only a smattering of vehicles traversed the lava Monday morning, although Kaleikini said 28 waivers covering 74 residents plus 11 minors have been signed. By 4 p.m. Monday, Kaleikini said 32 people in 22 vehicles had been checked in. According to Hawaii County officials, 56 properties with structures remain in the kipuka. “It feels good, it feels like coming back home,” said David Zuhars, one of the first residents to drive across the approximately 3/4-mile-long road. 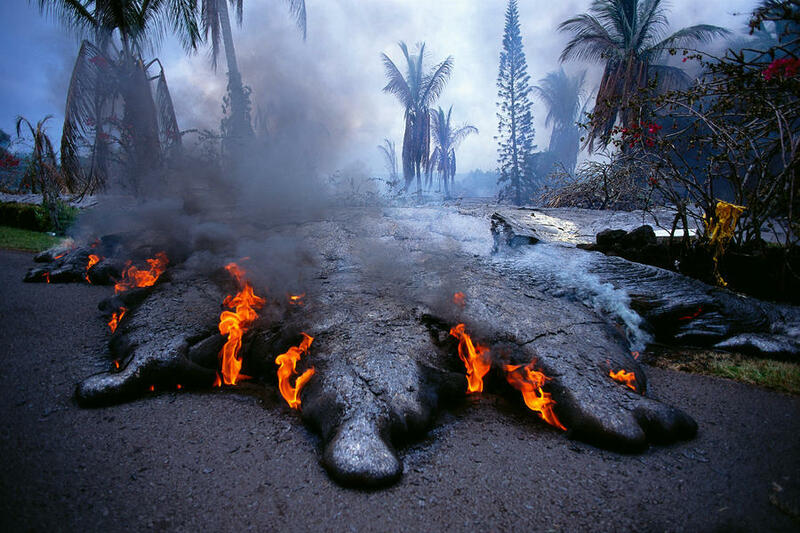 Zuhars said he returned to his home in the kipuka before, but only through a taxing hike over the lava. Being able to access his home by vehicle will allow him to return full-time, after staying at friends’ homes and in a disaster shelter for more than three months. Kaleikini said PGV can temporarily close the road at its discretion to ensure residents’ safety, such as during periods of extremely poor visibility. Furthermore, during times of high traffic, Kaleikini said residents will have to be patient, as the road is too narrow to accommodate opposing traffic lanes. At the other end of the lava, residents Harald Fischer and Debbie Kalaluhi waited to greet incoming vehicles. The pair returned to their respective homes in the kipuka earlier by other means, but also signed waivers authorizing them to use the road. Fischer said he has remained within the kipuka for months, assisting other residents with transporting property across the lava and securing their properties. His dirt bike, the only vehicle available to him in the kipuka, accumulated more than 500 miles of travel within the kipuka alone since the eruption. “We had to airlift all our possessions and our dogs back in here,” Fischer said. “It’s good to be free to come and go now,” he added. Kahaluhi said she hopes the restoration of access will lead to the county clearing Highway 132 of lava, which has been a widely requested project for months. Until then, however, Kahaluhi said she is glad to be able to come and go as she pleases. “Going to the store, going to the bank — we couldn’t do that before, we took that for granted,” Kahaluhi said. A public meeting will be held Friday night regarding Puna Geothermal Venture, although scientists have already answered one set of pressing questions. Puna Geothermal Venture, or PGV, shutdown operations during the 2018 eruption of Kīlauea Volcano on the lower East Rift Zone. The company has not been back online since. However, now that Kīlauea is quiet, PGV-parent company Ormat is working to bring the power plant back to life. While PGV and its employees are looking forward to getting back to business, some in the community are not happy about it. A segment of the Puna population is opposed to the industry in their backyard, saying the facility poses a hazard due to its close proximity to residential neighborhoods. Some even wonder if the geothermal facility had something to do with the 2018 eruption. “Why won’t our elected officials, civil defense, HVO scientists or permitting department heads look at the reality of the problem that geothermal is not safe use on an unstable active volcanic hot spot where there is human populations all around?” Steiner asked in another letter. Following the recent Magnitude 5.5 earthquake on Hawaiʻi Island, Steiner penned another letter. This time, she asked scientists a direct set of questions (below). 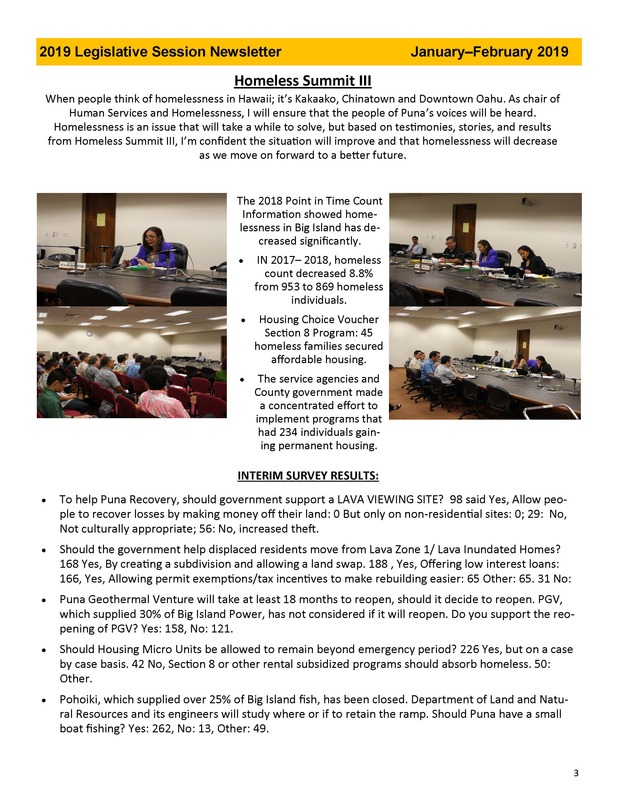 “With PGV trying to insinuate itself back into Puna with certain trusted government agency blessings, it is ripe for HVO to make that assessment now and please do it as if your kids live in Leilani Estates, because it is time to think of the people and the environment first and foremost, not greedy fracking polluters trying to hide under the guise of renewable energy,” Steiner wrote. So, it would be really nice to hear from HVO about what happens to our underground rift zone when billions of gallons of cool chemical soup is reinjected under pressure for 30 years??? We are not sure what you mean by “billions of gallons of cool chemical soup.” Magma is certainly not characterized that way, and we don’t know of anything else that has been injected into the ground in that volume for 30 years. Since you mention PGV in your last statement, perhaps this question is referring to geothermal drilling or fluid injection. If so, it is unlikely that PGV is injecting fluids at high enough pressures or volumes to affect the rift zone. If not, please clarify what you’re asking and we will try to answer. Could it erode holes or fracture the ground so much that the lave sprang forth? (1) The magma that eventually erupted in Puna was injected into the LERZ from Kīlauea’s summit and upper parts of the East Rift Zone near Puʻu ʻŌʻō hours-to-days before the LERZ eruption began. This NOAA animation depicts the earthquakes that occurred between April 30 and May 6, 2018. The earthquakes reflect the migration of magma from the summit/upper East Rift Zone to the LERZ just before and after the eruption began on May 3—and clearly show that the LERZ eruption did not originate with the PGV development. (2) PGV is located on the East Rift Zone because a small hydrothermal resource heated by past eruptions is found there. Prior to the 2018 eruption, the most recent LERZ eruptions in Puna were in the 1790s (Lava Tree State Monument), 1840 (Kaohe Homesteads through Nanawale Estates), 1955 (Steam vent area along hwy 130 to Halekamahina), and 1960 (Kapoho)—well before PGV started drilling. (3) Kīlauea is one of the most active volcanoes in the world. It was inevitable that, at some point, the Puʻu ʻŌʻō eruption would end and another eruption would begin on the volcano—and based on past activity, it was known that the next eruption could be located within the upper, middle, or lower part of the East Rift Zone. It just so happened that the 2018 eruption was on the LERZ. (4) There is evidence of eruptive vents along the LERZ, both north and south of Leilani Estates. Unfortunately, many of the volcanic features indicative of the active rift—craters, cinder cones, steaming vents—were/are disguised by lush vegetation or have been removed by quarrying or grading, leading to a false sense of security in those areas. It was a matter of “when”—not “if”—another eruption would occur on Kīlauea’s LERZ as indicated by Zone 1 on the USGS lava-flow hazard zone map. (5) The 2018 fissure is within Kīlauea Volcano’s lower East Rift Zone (LERZ) and was located between the 1955 and ~1790 fissures. Because of these (and other) earlier eruptions, the East Rift Zone was rated as Zone 1 on the Lava-Flow Hazard Map for Hawaiʻi Island. Zone 1 is defined as: “Includes the summits and rift zones of Kīlauea and Mauna Loa where vents have been repeatedly active in historic time.” These areas are the most dangerous because all, or nearly all, erupted lava first emerges from the ground within Zone 1. For more info on lava-flow hazards, please see this. In a straight line of 24 fissures in front of the frackers?? We don’t know what you mean by “frackers.” But to address the “straight line of 24 fissures” part of your question … Vents that erupted in 2018 opened along the lower East Rift Zone, which is a more-or-less linear structure, so it is no surprise that the fissures erupted along a more-or-less “straight line.” This “line” of 2018 fissures passed south of the PGV property. Also … If you look at a map of the fissures that erupted on the LERZ in 1790, 1840, 1955, and 1960 (before PGV started), you will see that they, too, are in a similarly straight line (for example, here). With more intensity than any recorded rift zone eruption??? While the 2018 LERZ eruption had some of the highest eruption rates ever measured on Kīlauea, they were likely similar to the 1840 eruption in this same area (Kaohe Homesteads through Nanawale Estates). Kīlauea has been capable of producing voluminous eruptions since it formed. Which then drained all the lava in the LERZ storage units in 4 short months???? There is no evidence that “all the lava in the LERZ” drained during the 2018 eruption. Chemical analyses have shown that lava erupted from the initial fissures of the 2018 LERZ eruption had been stored in the rift zone since the 1955 eruption. In other words, not all the magma that moved through the rift zone in 1955 was erupted to the surface. What did not erupt was stored below ground until the recent intrusion of magma “pushed” it to the surface. The same is likely true for the 2018 eruption – it’s possible (even likely) that not all of the magma that intruded the rift zone erupted to the surface in May-August 2018. The Puna Geothermal Venture meeting will take place from 4-6 p.m. Friday night at the Pāhoa High & Intermediate School cafeteria. Puna residents impacted by last yearʻs Kilauea eruption are returning to their homes although they have only partial access, according to the Hawaii Tribune-Herald. Puna Geothermal Venture, a subsidiary of renewable energy company Ormat Technologies Inc., is working to provide access to the area through its site near Highway 132. The company has scheduled a March 22 meeting to discuss details with residents. “PLZ OPEN HWY. 132” is painted on Highway 132 inside an area isolated by last year’s Kilauea eruption. Rep. San Buenaventura represents Puna, Hawaii. These poll results appeared in her Jan./Feb. 2019 community newsletter. The owner of a Hawaii geothermal plant that had to close during last year’s eruption of Kilauea Volcano plans to bring the plant back online by the end of the year. Ormat Technologies CEO Isaac Angel made the statement in company financial results released last week, the Hawaii Tribune-Herald reported. The 38-megawatt Puna Geothermal Venture plant was taken offline and evacuated soon after the volcano began erupting May 3. Before the eruption it provided nearly a quarter of the electricity used on the Big Island. Lava destroyed a substation and covered a few geothermal wells during the eruption. It also cut off road access to the power plant. Otherwise the plant was spared significant damage. Puna Geothermal built a temporary road in December, allowing people and equipment to traverse the hardened lava channel. The plant still needs serv­ice power lines to connect to the Hawaii Electric Light Co. grid in order to test all the equipment. A water well has been constructed to restore water service. Angel didn’t note any major hurdles preventing the power plant from restarting. Mayor Kim discussed Puna Geothermal Venture’s plans for powering back up. He said the new road to the geothermal energy conversion plant was built over the lava flows on private property at PGV’s expense. PGV back online in 2019? HOLLYN JOHNSON/Tribune-Herald An aerial view from Feb. 15, 2019, shows the 2018 lava flow and Puna Geothermal Venture in Puna. 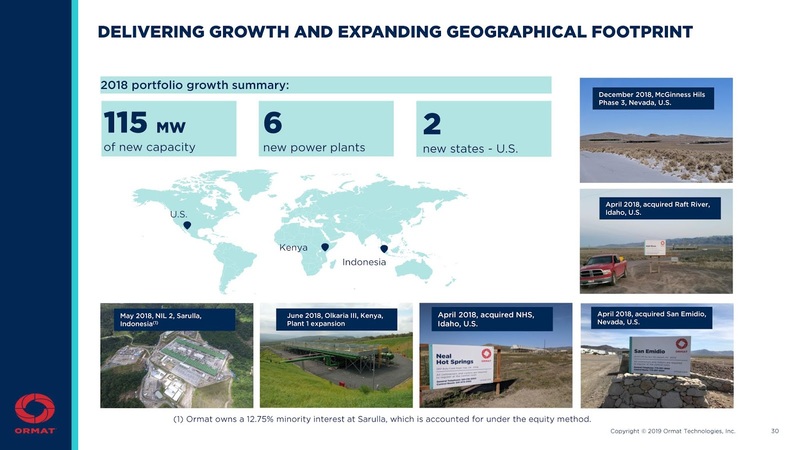 Ormat Technologies, the owner of Puna Geothermal Venture, plans to bring the 38-megawatt power plant online by the end of the year. CEO Isaac Angel made that statement in the company’s fourth-quarter and full-year financial results released Tuesday. The state’s only geothermal power plant, and a major renewable power producer for Hawaii Island, shut down last year during the Kilauea eruption. Lava destroyed a substation and covered a few geothermal wells, as well as cut off road access to the power plant, but it was otherwise spared significant damage. PGV built a temporary road in December, allowing people and equipment to traverse the hardened lava channel. The power plant still needs service power lines to connect the plant to the Hawaii Electric Light Co. grid in order to test all of the equipment, but a water well was constructed to restore water service. Angel also said insurers are paying for costs of the destroyed property, though not all agree that business interruption coverage started May 2018. He said the company is trying to resolve that disagreement. Despite the shutdown, Ormat saw revenue increase by 3.8 percent compared with 2017. Mike Kaleikini, senior director of Hawaii affairs for Ormat, said PGV and its landowner, Kapoho Land Partnership, are still working to open an access road to isolated homes off Highway 132. He said liability issues need to be resolved first, and that could be done in the next few weeks. Kaleikini said there as many as 20 people working at the site each day. “We’re gearing up to bring everybody back,” he said. According to Ormat, the electrical substation is expected to be rebuilt during the last quarter of the year. A large rig also is being shipped to allow for drilling of new wells if needed. With regards to Puna, work is underway to resume operation of the plant. We have constructed a new access road to the power plant, drilled a new fresh water well and started to open a production well. Initial tests from the geothermal injection wells indicate higher temperatures at the reservoir with no sign of any negative impact on pressure. In light of that, we currently estimate that we will be ready for operation by year end 2019. The Hawai’i County Council is in the process of accepting $170,355 in monetary donations for eruption disaster relief. Most of the money is coming from Puna Geothermal Venture ($150,000). The remainder comes from Tokyoto Oshimamachi ($18,274.22), Saishoin Temple ($2,000), and Sister City Mayor Inoue ($80.44). According to the council resolution accepting the money, the funds would be used to help offset costs incurred relating to the 2018 lava disaster in the lower Puna region. “That’s $150,000. That’s a lot,” Mayor Kim said during a January 8 council committee meeting. “But that won’t even pay for one foot” of a reconstructed road. In order to accept the donations, the council must pass a resolution and then appropriate the revenue with a bill. 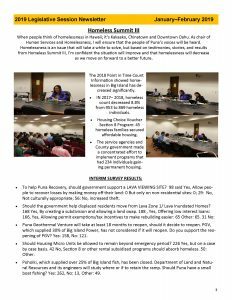 During a January 22 council Finance Committee meeting in Kona, the council began the process. Administration officials confirmed the donations haven’t been earmarked for anything yet. Councilwoman Sue Lee Loy wondered if maybe the money could be put into a separate account that could be handled by the Puna council representatives. The Finance Committee advanced Resolution 30-19 and Bill 12 to the full council with positive recommendations. Plant Operator I – The primary responsibility of a Plant Operator is to ensure that the operation of the power plant is safely and efficiently carried out in accordance with plant safety procedures and standard operating procedures. Wellfield Mechanical Maintenance Tech – This position is responsible for performing the tasks required to install, repair, modify, overhaul, diagnose, test, and maintain power plant equipment and systems. Councilwoman Ashley Kierkiewicz, left, talks with residents Tuesday at the Pahoa Community Center after a meeting about restoring road access to homes isolated by the 2018 Kilauea volcano eruption. On her left are Civil Defense Administrator Talmadge Magno and Ron Whitmore, county Research and Development deputy director. In the meantime, Puna Geothermal Venture and Lono Lyman, who leases land to the power plant, are working on amending a grubbing and grading permit to extend its temporary access road to the kipuka of about 50 properties that are surrounded by the flow. PGV built a road over the hardened lava channel last month to its site off Highway 132. Property owner Deseree Hughes said PGV officials are heroes for trying to help them get reconnected. Hawaiʻi County Mayor Harry Kim thanked Puna Geothermal Venture executives for a six-figure donation, a short time before the company was granted permission to cut an access road over the inactive lava channel that isolated the company’s power plant during the summer eruption of Kīlauea Volcano. The lower East Rift Zone eruption of Kīlauea began on May 3, 2018 and forced Puna Geothermal to shut down. For several dramatic weeks, lava threatened to inundate the power plant, and officials scrambled to prevent a potential catastrophic interaction between the volcanic activity and the resource wells at the industrial facility. PGV has been offline ever since. “I want to take this opportunity to thank you personally for being there with our first responders at Civil Defense day in and day out during the four-month emergency. Your presence was extremely helpful; it showed your spirit of solidarity with everyone involved,” the mayor wrote. On December 6, Kim signed a Sixth Supplementary Emergency Proclamation, lifting a set of lava-related prohibitions and allowing private lot owners to make “limited restorative physical modifications to the lava flow field surface on their private lot as authorized.” Puna Geothermal Venture was given approval to start work on an access road. Work on cutting a “pioneer road” over the large lava channel was completed on December 14, the Hawaiʻi Tribune-Herald reported. Contacted by phone before the Christmas holiday, Kaleikini told Big Island Video News he would have an update after the holiday. A Leilani Estates street was blocked by lava flow Sept. 8. The Big Island produced a lot of new lava rock this year, and some of it could be the raw material for a new local industry, according to a report commissioned by a state agency. The report said there’s potential to commercially produce a versatile building material called basalt fiber — similar to carbon fiber and glass fiber from rock. A production plant on Hawaii island costing $78 million could generate an average annual profit of $15 million over 30 years and employ 81 people earning $75,000 on average, said the analysis by California-based consulting firm SMA Inc. But challenges also exist, including uncertainty over whether lava rock on the island is suitable for producing high-quality basalt fiber. “Hawaii County is an ideal location for a basalt fiber manufacturing plant due to the ease of access to basalt and desire from the Hawaiian government to develop the nascent industry, however there are a number of risks and issues,” the report said. The Pacific International Space Center for Exploration Systems, an aerospace center in Hilo operating under the state Department of Business, Economic Development and Tourism, commissioned the report from SMA after issuing a request for proposals last year. The agency is exploring basalt fiber because it is seen as something that can be produced and used on the moon and Mars. Basalt, which is made up of varying levels of three minerals — plagioclase, olivine and pyroxene — is similar on the Big Island, the moon and Mars, according to the agency. Basalt fiber can be made into durable fabrics, rebar, insulation materials and structural mesh. It can be used in place of nearly all applications that use asbestos and is more resistant to heat, abrasions, corrosion, vibrations and chemicals, according to PISCES. The fiber is produced by crushing, washing and melting rock, which is then extruded into fine filaments that can be made into different products. SMA’s report said the worldwide value of basalt fiber production is estimated at $178 million this year and is expected to grow to $405 million in the next decade. The company said most basalt fiber is made in Russia and China. The report also identified plants in Austria, Ireland and one established earlier this year in North Carolina by the operator of the plant in Ireland. SMA said U.S. producers can’t compete on price with plants in Russia and China, so they need to focus on quality, customer service and technology. “Limited manufacturing capacity in the United States means there is an opportunity to establish a local champion to meet emerging needs for U.S. customers,” the report said. In Hawaii, SMA suggested producing stringlike strands of basalt fiber instead of other products such as rebar because it has a broad customer base and it’s easier to produce, sell and export. The company said that even with Hawaii’s high costs for labor, materials and energy, a plant could generate about $33 million in revenue and $15 million in profit annually over the long term. 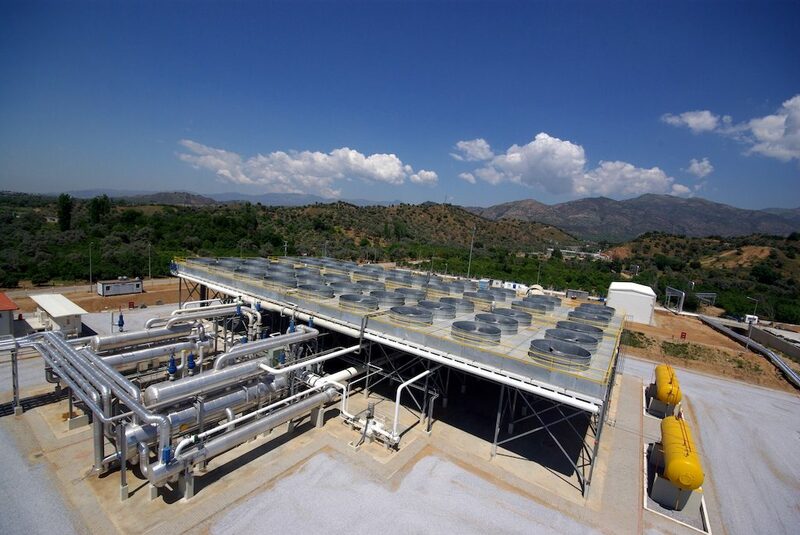 Risks for a local plant include energy cost increases, labor cost and availability, community activist opposition, trade-war tariffs and currency rate fluctuations, the report noted. PISCES has determined that the mineral composition of lava rock on the Big Island can produce basalt fiber, but SMA said testing the strength of basalt fiber made from Hawaii rock hasn’t been done. “None of these risks alone will break the business case, but taken together they could severely limit the viability of the venture,” the report said. A photo taken during an overflight of lower Puna by Blue Hawaiian Helicopters shows lava flanking Puna Geothermal Venture on June 3. Puna Geothermal Venture has access to its lava-locked site after a “pioneer road” was cut over the large lava channel from the recent Kilauea eruption. Access was restored as of Dec. 14, though work is ongoing to improve the path, said Mike Kaleikini, senior director of Hawaii affairs for Ormat Technologies, PGV’s owner, on Thursday. The hardened channel was about 250 yards to 300 yards across and about 60 feet tall at its highest point, he said. Kaleikini said no “abnormal temperatures” were found during road construction. He said the rock was mostly packed down so crews didn’t have to dig down deep into the channel. PGV needed road access to fully assess the status of the plant, sandwiched between the channel from fissure 8 and a string of other volcanic vents. “It looks like the plant is in pretty good shape,” Kaleikini said. PGV will know more after it restores power and water service. He said PGV is talking with Hawaii Electric Light Co. about getting permission to place power lines across the channel alongside the road. A county waterline that remains in service can be accessed by connecting near Highway 132, Kaleikini said. Kaleikini said he didn’t have an estimate for how long that could take. It remains unclear when the plant, which has a capacity of 38 megawatts, will be able to restart. Kaleikini previously estimated 18 months. The operators of a Hawaii geothermal power plant have started restoring road access to the property cut off by lava from the Kilauea volcano eruption. Big Island Mayor Harry Kim authorized a vegetation removal and grading permit for Puna Geothermal Venture to clear lava for a road to its site, the Hawaii Tribune-Herald reported Wednesday. 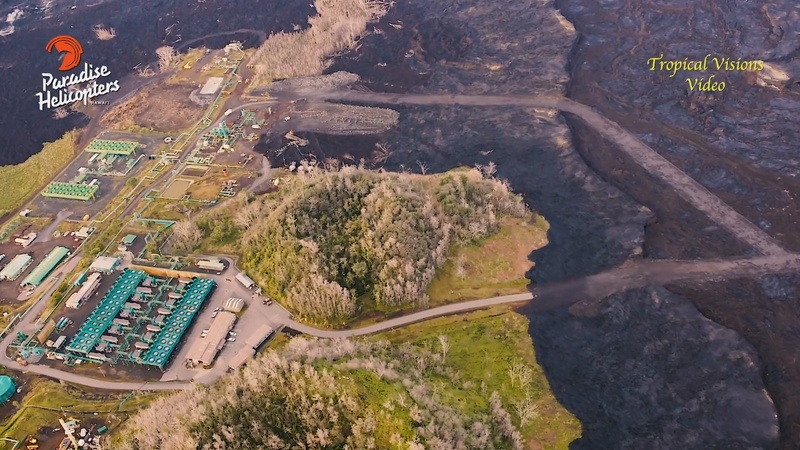 The plant near the intersection of State Highway 132 and Pohoiki Road is sandwiched between the main lava channel and a string of fissures that opened during the eruption. Work clearing a path began over the weekend, said Mike Kaleikini, a senior director for plant-owner Ormat Technologies. The new road will run parallel to the highway until it reaches the plant’s former driveway. It will then need to cross the lava channel, which is up to 400 yards wide, he said. The project could take a week or two to complete, Kaleikini said. The permit was granted after Kim issued a supplemental disaster declaration, which allows the county to permit the clearing of fresh lava rock. Kim said he asked Ormat officials to also help restore road access to adjoining properties. Kaleikini said Ormat is committed to helping neighbors regain access, but he noted liability issues would need to be worked out. Restarting operations at the geothermal plant could take about 18 months, Kaleikini said. The timeline will depend on assessments that have been mostly put on hold because of the road access problem. Big Island officials are waiting to assess if other inundated roads can be restored until six months have passed from when the Hawaiian Volcano Observatory reduced the volcano alert level, which occurred in early October. Work began last week to restore road access to Puna Geothermal Venture. Access to the power plant was cut off in May due to Kilauea’s volcanic eruption. A representitive for Ormat, the company that owns Puna Geothermal Venture, says it could take 18 months for operations to begin again. Their first step is assessing the area for safety once ground access is complete.